Objective: We previously developed a preoperative risk calculator for Emergency Surgery (ES). We sought to derive a novel abbreviated Emergency Surgery Acuity Score (a-ESAS) that specifically evaluates the severity or acuity of disease at presentation in patients undergoing ES. Design: Using the 2011 ACS-NSQIP database, we identified all “emergent” surgical procedures. A 5-step methodology was designed: 1) identification of independent predictors of 30-day mortality using multiple logistic regression models; 2) exclusion of co-morbidities/demographics while retaining markers of acuity, defined as physiologic derangements occurring in acute illness (e.g. laboratory variables, evidence of acute organ failure); 3) derivation of a-ESAS based on the relative impact (i.e. odds ratio) of each predictor, using weighted averages; 4) measurement of the score c-statistic; and 5) a-ESAS validation on a separate database using the 2012 ACS-NSQIP database. Results: Of 280,801 ACS-NSQIP patients, 24,702 underwent ES; mortality at 30 days was 9.2%. The derived 14-point score includes 10 components [Figure 1]. Its c-statistic measured 0.8. Mortality gradually increased from 1.7% to 37.5% to 100% at scores of 0, 7, and 14 respectively. In the validation phase, a-ESAS c-statistic also measured 0.8. Conclusions: We therefore propose a novel acuity score (a-ESAS) to predict mortality in ES patients. 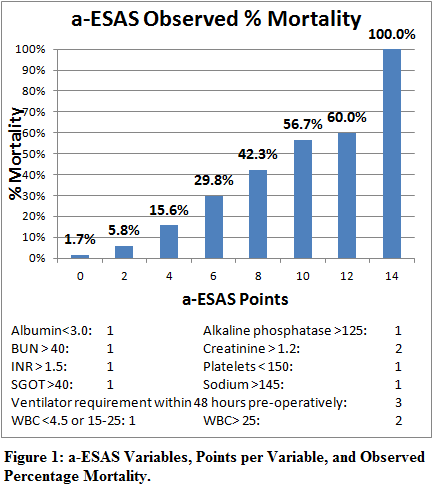 Combined with patient co-morbidities, a-ESAS could prove useful both for patient preoperative counseling and for benchmarking the quality of care of ES.